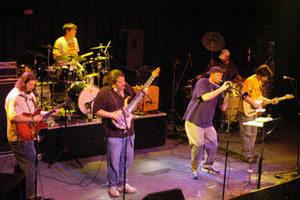 Originally conceived as an informal improv ensemble, The Work, the horn-driven funky band from Greenville, SC, have grown into a cohesive and formidable unit of gifted musicians who have brought their diverse talents together to make for a unique experience that keeps the feet moving, faces smiling, and fans guessing what’s next. If you listen to their debut CD Bring Back The Good, you’ll hear the sound that’s been moving the feet of thousands of people around the southeast since 2001. Drawing on influences that range from Curtis Mayfield to Miles Davis, with a micro-dose of the Grateful Dead in the mix, The Work’s material is upbeat and uplifting with a sound that picks up where 70’s funk and R & B left off. The band is comprised of Mark Dye on bass, Charles Hedgepath and Mitch Towles on guitar, Craig Sorrells on trumpet, Jason Owens on drums and newest member Dan Roth from Athens, GA on keyboard. All members of The Work began playing music early in life and each has shown a steadfast devotion to his respective instrument. It is their willingness to accept and experiment with different musical styles that have enabled The Work to collaborate and jam with many talented performers. In the past few years The Work’s stage has been graced with the likes of Jeff Sipe of Leftover Salmon, the Reverend Jeff Mosier, The Dirty Dozen Brass Band, and John Keane to name a few. In addition, The Work have opened for the likes of Grammy™-winning Toots and the Maytals, The Wailers, Merle Saunders, Col. Bruce Hampton and a long and growing list of nationally recognized performers. In 2005 The Work released their CD, Bring Back The Good, produced by John Keane (R.E.M., Widespread Panic, Indigo Girls). The CD features the horns of The Dirty Dozen Brass Band on two tracks. Bring Back The Good features four different and original songwriters. The Work not only converge disparate styles, they also show an adept ability to slip seamlessly from one to another. What holds all these elements together on this disc? No doubt it is their sheer, unbridled joy of playing music, and the brilliance of John Keane’s direction. The Work’s raw appeal and the power of the Dirty Dozen Brass Band horns performances on “The Music Matters,” and “Losing Ground,” pull the listener in close where gravity holds them in a tight orbit.